Hidehito Komaki pulls a dried pod from the flowering stem of a cabbage plant and carefully splits it. Both sides are lined with tiny brown beads. “Each of these is a seed,” Komaki explains to those clustered around him. “A single cabbage plant produces about 3,000 in total,” he says before giving instructions for collecting and storing the seeds. This seed collecting workshop is an integral part of what Komaki sees as his mission. 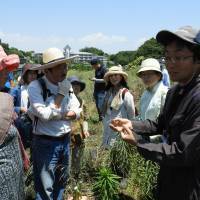 After majoring in agricultural biotechnology at the Tokyo University of Agriculture, he joined a multinational corporation to work on new vegetable varieties. Dismayed by data that showed plummeting nutrition levels in the resulting hybrids, Komaki left to farm using traditional methods and heirloom seeds. “We were making these perfect vegetables, but there was no respect for the vegetable itself, its character, taste or habits,” Komaki says. 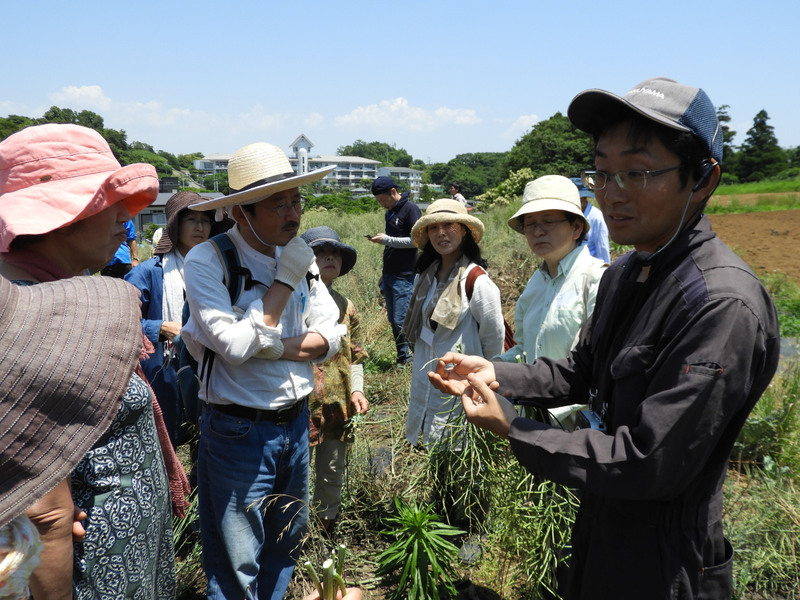 Ten years later, he now works his family’s land in Hiratsuka, Kanagawa Prefecture and teaches about the value of heirloom varieties. In 2013, Komaki established Shonan Takatorikosono with other local growers. Dedicated to growing and preserving heirloom varieties, the 16 members are located in Hiratsuka and Odawara. They hope to tap into some of Komaki’s success with regional vegetable sellers while helping to preserve these varieties. All of them grow negi (green onions), cabbage, komatsuna (Japanese mustard spinach) and spinach, and some also grow local varieties of buckwheat, eggplant, melon and carrot. The group meets twice a year to exchange seeds and share best practices for seed saving and soil management. Members use only natural methods and materials. They collect fallen leaves from nearby forested areas and till them into the soil to create an ideal growing matrix of nutrients and minerals. This, Komaki says, is pivotal for these traditional varieties. “Heirlooms are deeply rooted in the local area,” Komaki says. “Because the seed has been saved for generations, it develops a close relationship with the soil and climate.” That relationship, Komaki believes, makes them more resilient to disease and pests without the need for chemicals. To illustrate, he pulls two broad bean plants from different parts of the field. Approaching the ends of their natural lives, their nearly leafless branches are heavy with shriveled black pods that rattle with seeds. The first plant, a hybrid he’s experimenting with, lifts out easily. The second one, however, an heirloom he has been saving seed from for 10 years, is harder to pull and has a thicker, longer set of roots. When packaged seeds became more readily available in the 1950s, many farmers and gardeners started to purchase them. Doing so was convenient and made it easy to find new varieties but came at the cost of losing many heirloom varieties. Hybrid, or F1, seeds, the most common type of seed available today, are the first-generation result of crossbreeding. Parent plants are crossed with one specific trait in mind such as disease resistance or color. Seed saved from these plants will not grow true, may not grow at all, or, in some cases, can’t be saved. Some are genetically modified to make them sterile and purchasers are often prevented by contract from saving seed. Hybrid growth also often relies on chemical fertilizers and pesticides. Seed companies point not only to their intellectual property rights (starting in 1991, companies with seed patents could prevent farmers trading those seeds), but also to hybrids’ high yields and ease of transport and sale. Hybrid vigor, one effect of a cross, results in increased yields for that initial generation. Heirlooms, on the other hand, can be more susceptible to pests or disease and have lower yields. They may also damage easily and be unfamiliar to consumers. However, for organizations like Yamayuri Co-op, one of the places Komaki sells to, heirlooms have distinct advantages. “These varieties are a perfect match between the weather and the land, and they have a long history. They are also very delicious,” says Shingo Kato, president of Yamayuri Co-op.